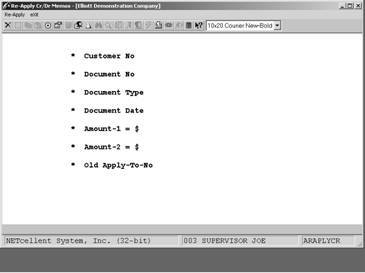 Using the Re-Apply CR/DR Memos application, you can apply a credit memo, debit memo, unapplied payment, or “Quick Adjustment” to an invoice. This application allows you to apply one credit memo or payment to several different invoices. It is a very easy and fast application to use in the situation where you have open credit on a customer's account and you want to apply that entire amount to one or several invoices, or where a credit or debit memo was issued to the customer's account, but it was not applied to any invoice, or to the wrong invoice. The “Quick Adjustment” feature is useful because it can replace the Credit/Debit Memo process when there is an insignificant amount involved, such as overpayment or underpayment by a few cents. The next time you print the A/R Aging Report, the credit or debit memo or unapplied payment will appear in the same aging period as the invoice that it now applies to. 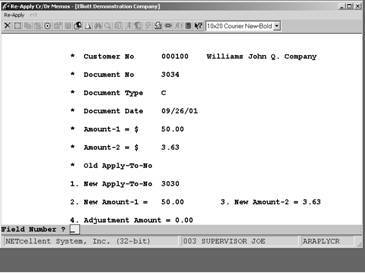 If the amount of the credit equals the amount still owing on the invoice, both will be cleared from the file the next time the A/R Open Item file is purged. NOTE: The Re-Apply function is not applicable to Balance Forward Type customers, only Open Item Balance Method customers. Enter the customer number. Press the F7 key for customer search by number or press the F8 key for customer search by name. Enter the number of the document, which you wish, to re‑apply. 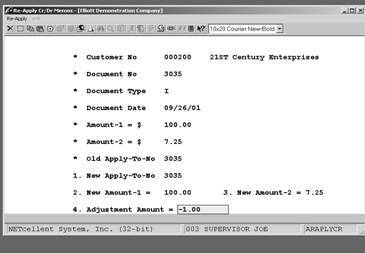 Enter the number of the invoice to which you want the credit or debit memo or payment that is displayed to now apply. 9 numeric digits with 2 decimal places (9,999,999.99). Enter the portion of Amount‑1 you wish to reapply to this apply to no. Enter the portion of Amount‑2 you wish to reapply to this apply‑to no. NOTE: The Re-Apply function is real time; as you complete the transaction, the records are updated. 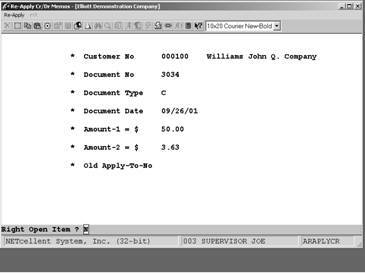 Scenario: Customer underpaid invoice by $1.00. 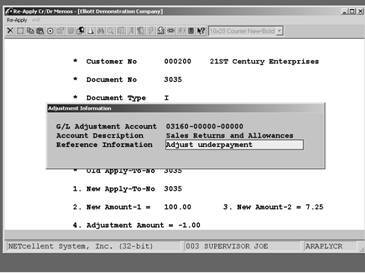 The above figure displays the adjustment amount, Field 4, required to zero out the invoice rather than do a credit memo or leave the invoice open. After pressing <enter> in Field 4, popup window appears with required entry. These fields must be completed or the system will not let you out of the window.